Shortcut for a AsciiValue auto pointer. Shortcut for a StringValueBase auto pointer. Set the value to that of the string buf. Overrides base class to append a terminating '\0' character if buf doesn't end with '\0'. Write the ASCII value up to the the first '\0' character to an output stream. Any further characters are ignored and not written to the output stream. 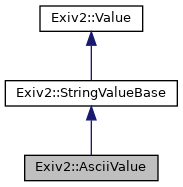 Value for an Ascii string type. This class is for null terminated single byte Ascii strings. This class also ensures that the string is null terminated.